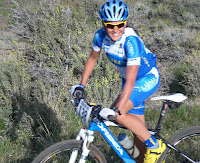 Katerina Nash is a strong cyclist with skiing in her background. Nash is a three-time Olympian, twice for Nordic Skiing and a third for mountain bike racing. She holds impressive wins for not only mountain bikes, but in cyclocross and road racing as well. I was disappointed to see that she wasn’t on the U.S. mountain bike team, but now I know why. Nash will be representing her native country, Czech Republic, for her fourth trip to the Olympic Games. Nash rides and races locally. She has been known to ride with the Reno Wheelman for training rides. The mountain bike races in London will be August 11 and 12 this year. The Women’s cross country race will be on August 11, the men’s race will be August 12. Nash is sponsored by the LUNA Chix Pro Team. “LUNA” is a sports bar company that launched the pro team to “bring together women interested in learning new sports, staying active and inspiring others to do the same. The team also does fundraising for LUNA’s non-profit partner, the Breast Cancer Fund.